Let me just come right out and say, I’m not ready for Fall. 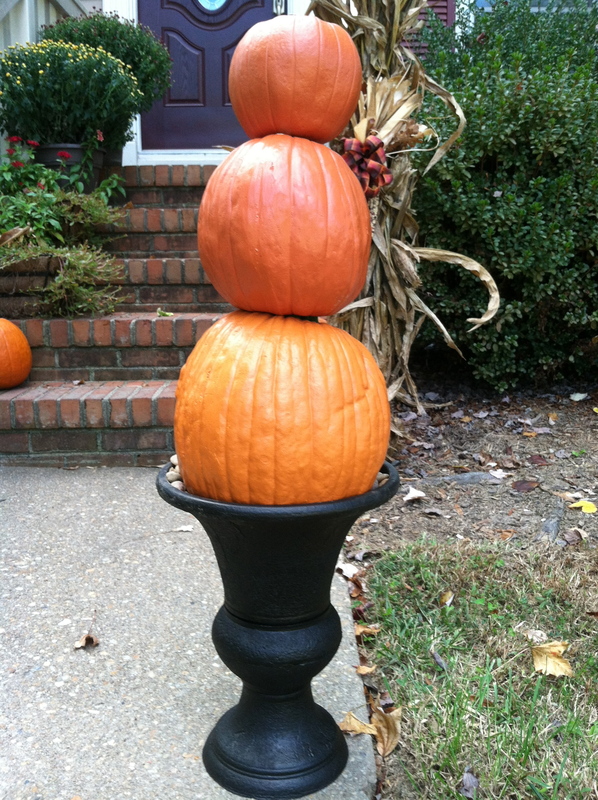 Typically I save my Fall decorations until October when the weather really starts to change in Virginia. 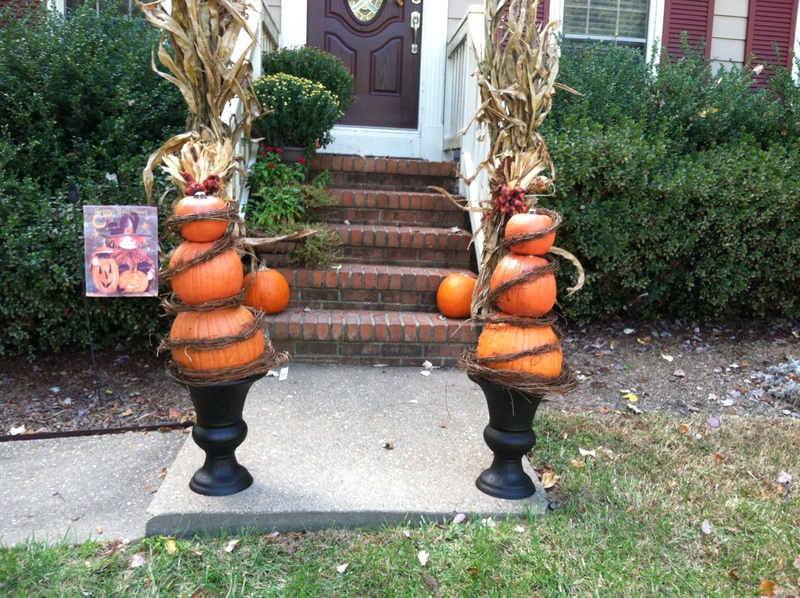 But, I keep seeing Fall decor all over the web, and it is unusually cool here in Virginia. 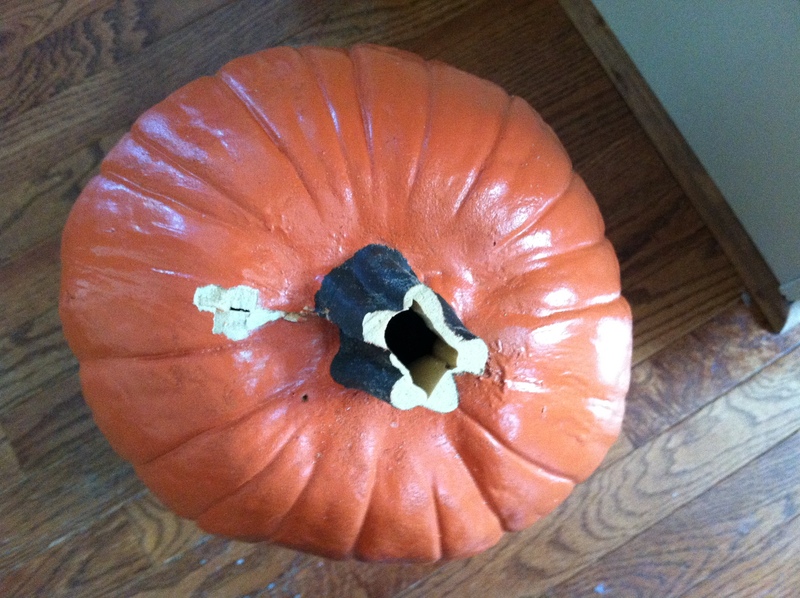 So, here’s an easy to make, reusable Fall project that you can knock out in a few hours. 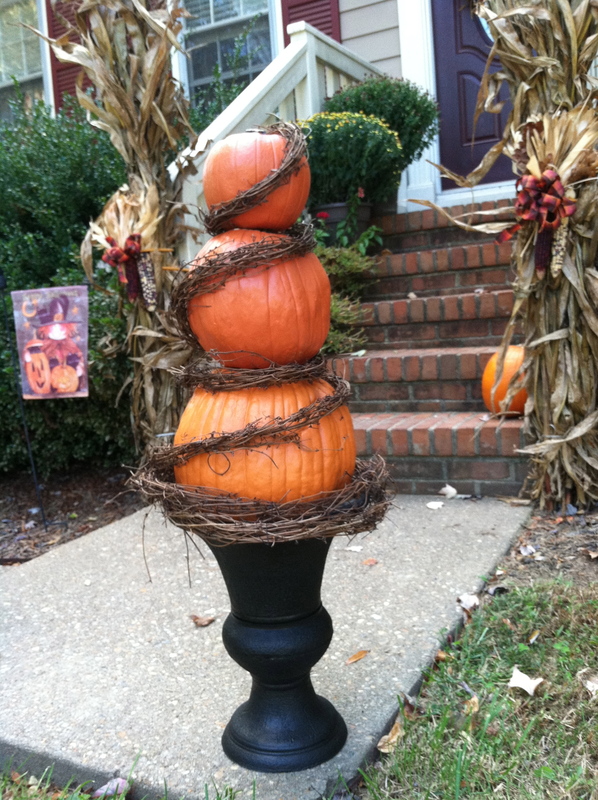 Easy to make, reusable Fall pumpkin topiary. My foam pumpkins came with holes already cut in the bottoms. If your funkins did not, use a knife to cut holes into the bottoms of the funkins so they stack on top of one another fairly well and sit straight. You may need to shave the foam down a bit for a nice fit. It doesn’t have to be tight, but you don’t want it to look like there is space between the funkins. After all your funkins are trimmed, dry fit them on the dowel. Dry fit the dowel in your pot. Mark the dowel if it needs to be trimmed and cut it down as necessary. Once you are happy with the way the funkins will fit into the pot, it’s time to assemble the topiary for real. 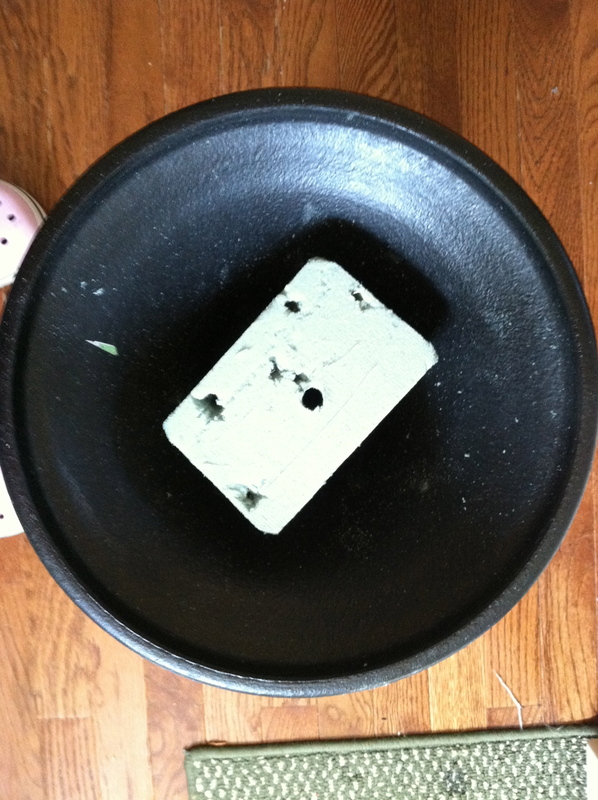 If your pot, like mine, doesn’t have drainage, you might want to use a drill to cut a small drain hole in the bottom. If the pot is lightweight, you may want to fill the bottom with rocks to help stabilize it. Cut the oasis cubes as needed to fill your pot. Place the oasis in the bottom of the pot. It should fit snugly. You can also secure the cubes with hot glue. Use hot glue on the end of the dowel that will be in the top of the fukin stack. 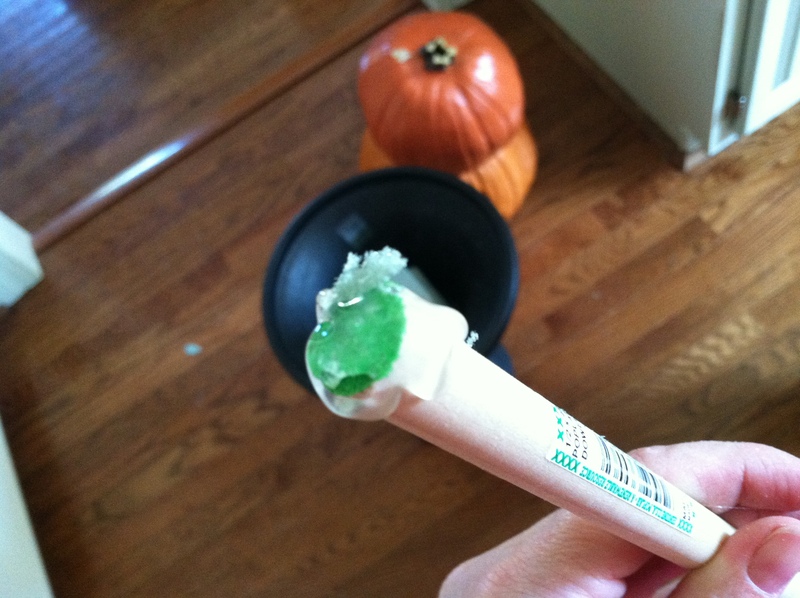 Squeeze a generous glob of glue onto the dowel and quickly stuff it into the top funkin. Hold it there until the glue has adhered to the funkin. 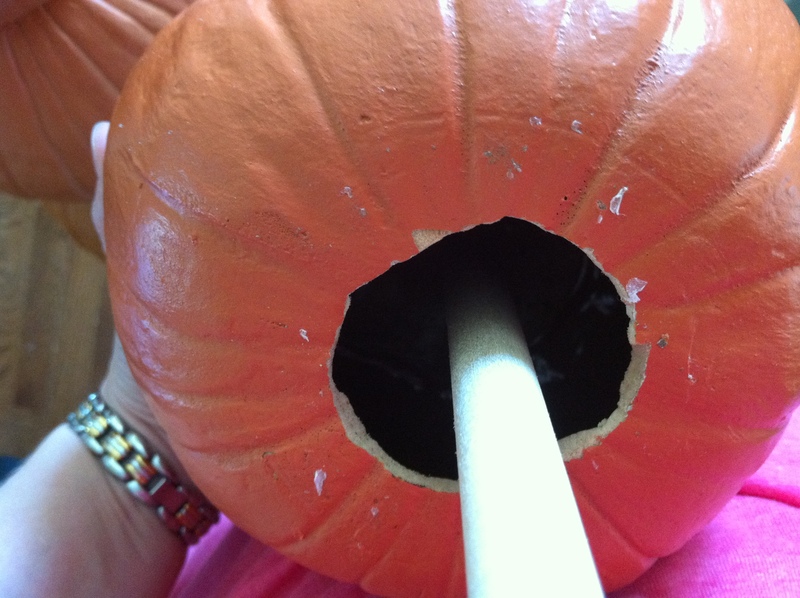 Slide the rest of the funkins onto the dowel and insert the dowel into the oasis. You can start to see that you have lots of options for decorating your funkins. You could use a white funkin with a spooky silhouette or your initial on it. You could spell out B-O-O if you want a Halloween topiary. You could also stuff in some sheet moss or fall leaves between the pot and bottom funkin. I wanted my topiary to last from September to November, so I chose to wrap it with grapevine and a bow. Grapevine comes in rolls at your local craft store. I needed one roll per topiary, but you might want yours more loosely wrapped and can get by with less. Buy two, you can always return one! Wrap the grapevine around your topiary until it looks right. 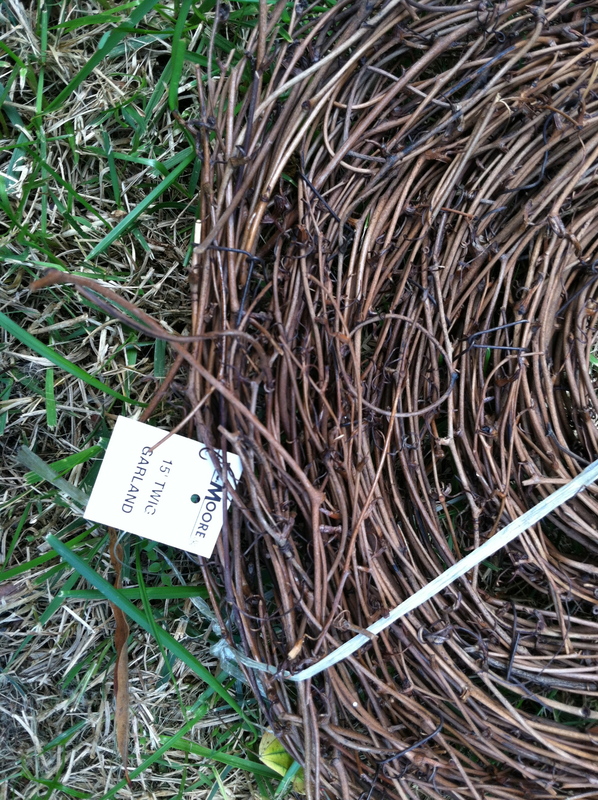 You may need to secure your grapevine in the back with some long straight pins if it doesn’t seem secure. You can push pins straight into the funkin. I added bows at the top with long tails that draped down over the topiary. You may choose to use bows or something else! You can see how I added some corn stalks and mums in the background on my front steps. As the season changes from Fall to Halloween to Thanksgiving, you can change the decor behind it to compliment your topiaries. And, best of all, since you use funkins, there’s no waste or rotting pumpkins to deal with! Just store your topiary til next year and use the pots for more seasonal decor. Since mine are plastic, they can stay out almost all winter with no worry of them getting damaged. Here’s another shot showing things moved around a bit. I added a seasonal wreath to the door, changed out and moved the flag, added a cool, blue pumpkin, and the mums finally started to bloom. Having the trees conveniently change color and scatter their leaves in the yard helps too! 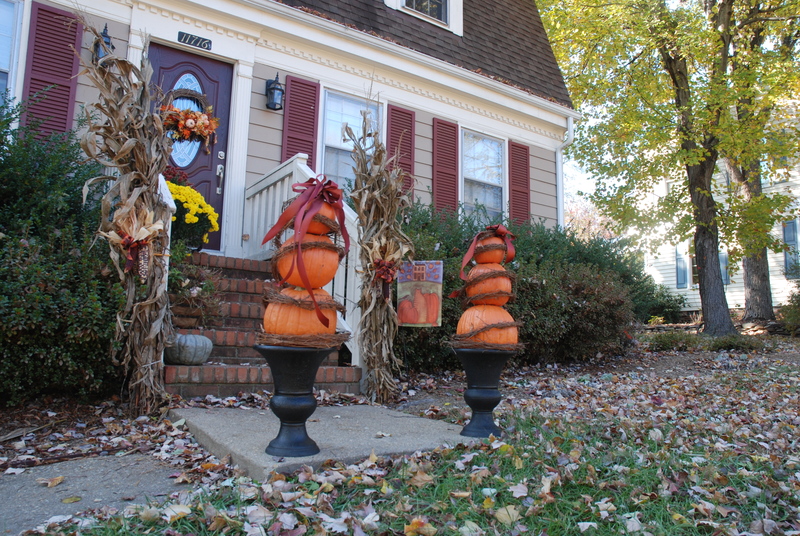 Here are links to some other great fall pumpkin topiaries. Hope you’ll make one of your own and share it!